The Waltham, MA-based team of HB Communications equipped the TD Garden’s Legends Club with a variety of innovative AV technology, including Christie projection, EAW loudspeakers, and NanoLumens displays. Larry Bird and Bobby Orr. Two of the greatest names in sports history, and legends whose play earned them godlike adulation among the fervent fans of Boston, one of America’s most passionate sports markets. Both of these transcendent heroes called the Boston Garden home; today, its replacement, TD Garden, is home to a new crop of talented basketball and hockey players who help keep the locals’ spirits high through the gelid New England winters. To reward the most passionate fans of the Celtics and Bruins with a place that honors their favorite franchises’ storied pasts, the arena’s management decided to upgrade the amenities of its private, members-only restaurant and bar, the Legends Club, with cutting-edge audiovisual equipment. The upgrades, performed by the Waltham, MA-based team of HB Communications, commenced in June of 2014 and were completed in time for the start of the 2014–2015 NBA and NHL seasons in October. Located on the third level of the arena, the Legends Club has access restricted to full and partial season ticket holders. But according to Andrew DeCesare, senior account manager at HB Communications, the Legends Club also plays a more important role to the franchises that call the arena home. In designing a space to both celebrate a rich history and inaugurate new heroes, a strong audiovisual element was essential. The installation included 26 Samsung thin-bezel displays, deployed via Peerless-AV mounts in various arrangements, including a three-by-three and two-by-two video wall around the main bar. Three Christie Digital 1080p projectors present sports programming on three 119-by-212-inch Da-Lite Advantage Electrol screens, and four of the space’s columns were covered with NanoLumens 5.6 millimeter LED display wraps. All of the video is fed from Crestron equipment, including a 32-by-32 DigitalMedia switcher, Air Media Presentation Gateway, and CresFiber fiber optic cables. On the audio side, 19 Eastern Acoustic Works loudspeakers are driven by a Crown CTS8200 eight-channel, 70-volt amplifier, with Biamp Tesira Server audio processor. For presentations and press conferences, two Shure wireless systems (an eight-channel and four-channel) with 10 SM58 wireless microphones and two wireless lavalier mics are incorporated. The crowning feature, however, are the Bruins’ and Celtics’ championship banners—presented virtually overhead in one of the first installations of NanoLumens’ new transparent NanoClear displays. HB Communications installed 12 of these two-piece projection displays, each of which measure two feet wide by three feet tall, from the ceiling along the length of the bar. 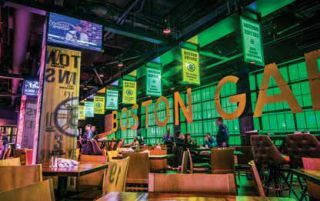 So no matter what kind of event the TD Garden hosts, ownership can be sure the most loyal fans have a one-of-a-kind space to enhance the experience.